After the weekend's powerful storm left California and Nevada dealing with massive mudslides, swollen rivers and flooded roadways, the Federal Emergency Management Agency activated its regional Response Coordination Center in downtown Oakland on Monday to prepare for a possible federal response. With another storm looming, it could mean compounded trouble for the Bay Area. 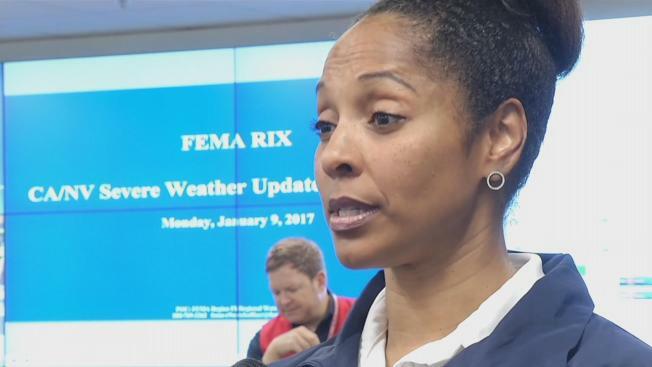 "We're looking ahead, looking at the next storm and posturing ourselves here with federal resources in the event the state calls us for assistance," FEMA's Ahsha Tribble said. The National Weather Service, part of the federal response team, said the next round won't be as powerful but could still bring big problems. Up to 7 feet of snow could fall in the Sierra Nevada and several more inches of rain could add to the already saturated Bay Area. "Soils are already prepped and very wet," said Scott Carpenter of the National Weather Service. "That's what's going to create issues of potential tree falls and additional flash flooding as we go into tomorrow." Tribble agreed. "We are not out of the woods," she said. "We have another storm coming our way, and the ground is saturated." Meanwhile, the city of Oakland is clearing drains and gearing up for another soaking, hoping to keep the rainwater flowing instead of flooding. "Keep it from flooding, keep everybody happy," said Kenneth Daye of Oakland's Public Works Department.